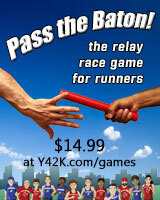 Home » Blog » marathon » Which Age Group Has the Easiest Boston Marathon Qualifying Time? The Boston Marathon is one of the few races that require most runners to beat a qualifying time to get in. Some runners do that on their first attempt, while others struggle for years, hoping that hard work and slower qualifying times for older runners will help them succeed. Boston Marathon qualifying (BQ) times for men and women drop by 5, 10, or 15 minute steps in five-year intervals to adjust for age. The 2015 WMA/USATF age-grading tables for marathon runners represent an even higher standard, not just “good enough to run Boston”, but “world record holder”. Those tables are created using the current best of the best, the fastest anyone has run a marathon at any one age. Age-grading formulas use these standards to compare runners of different ages on a more level playing field, assuming that the data represents the changes due to age for a typical runner. If you look at the data sets by gender, the men’s BQ times are always 30 minutes faster than the women’s at every age. Meanwhile, age-standard times for men and women start out a bit under 15 minutes apart, and then separate with age, with the women’s curve slowing faster than the men’s. 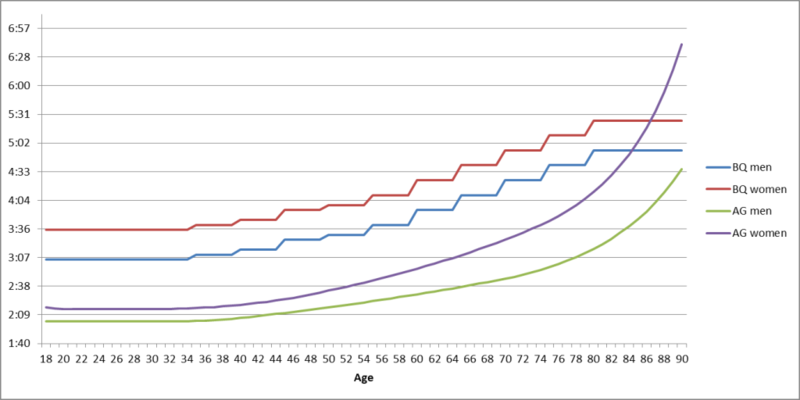 So while the curves change with age in a similar way, the relationships between them change as runners get older. The data can be used to calculate the relative difficulty of qualifying for Boston by gender and/or age. The closer the BQ time is to the age-standard time, the harder it is for a typical runner to achieve their Boston qualifier. The higher the age-graded score (expressed as a percentage of the standard time for that age) is, the more difficult the BQ time. 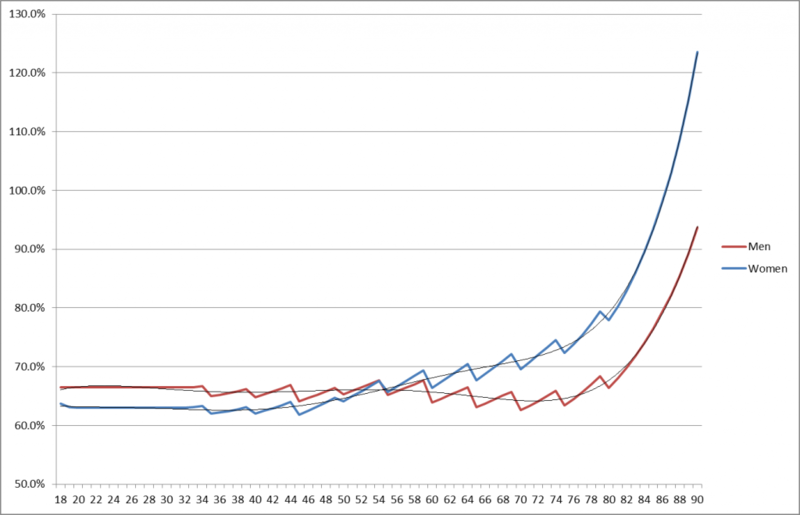 In general, qualifying gets harder as you get older, but the women’s curve has a steeper climb. If you look at men only, the 70-75 age group has it easier that the rest. And women have it easier than men until about age 55. 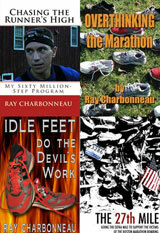 Keeping all that in mind, who has the easiest route to a Boston Marathon qualifier? It’s women in their late 30’s, followed closely by men in their early 70’s. The lowest scores for any one year are for 45-year old women and 70-year old men. On the other hand, the very oldest runners have to set records just to qualify. That’s inevitable, unless the BAA gets permission from the cities and towns along the course to keep the course open even longer than they do now. But the oldest runners are an edge case – there just aren’t that many 80- or 90-year-old marathoners. Of course, we’re making plenty of assumptions here. Probably the largest is that the age-standard tables represent the aging curve for a typical runner, even though the runners who establish these standards are anything but typical, and few runners stay at one level across an entire career. Also, we’re assuming that those standards accurately represent peak performance across the entire age span. It might be that women really do lose ground faster than men as they age. But relatively few women compete in the later age groups. It seems more likely that the standards for older women are ‘soft’, and we’ll see the standards get tougher when more women from the running boom eras age and start to challenge them. Or maybe, since there are relatively few older runners of either gender, a few outliers (cough*Ed Whitlock*cough) could have an inordinate effect on one of the curves. Does this mean Boston Marathon qualifying standards are right or fair? Who can say? Anything other than straight time qualifying inevitably involves making subjective choices about who gains and who loses. Remember that this is the fast end of the distribution curve. Relatively few runners come close to qualifying, and even fewer make it. You can find more number-crunching articles for runners, along with other fun, in my book, Idle Feet Do the Devil’s Work. The late George Sheehan advocated not only for age related considerations but most importanly allowances for different weight classes as well. Therefore the BQ times are unfair to big and heavg runners of any age group. As a large marathoner with 20 marathons under my belt and struggling to get anywhere near a BQ time, life isn’t fair. Fit the requirements and re evaluate. interesting analysis, however I think a more accurate representation of difficulty would be achieved by comparing the BQ time with the average time of all runners at a specific age, rather than the world record holder. This really shows one how far above the mean a runner has to be at a specific age rather than how far down from the absolute best at a specific age. I think your results will be different in that case skewing towards the younger folks having the toughest BQ time instead of the easiest. 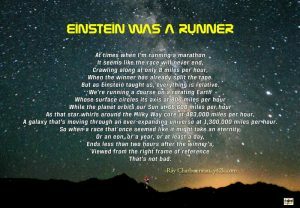 One problem with that idea is how do you calculate the ‘average’ marathoner? There’s no stable, consistent way to do it. For example, back in the 60’s the average was possibly sub-3, because those were the only people who ran. I really appreciate you putting this together. I often hear men complain that the time differentials aren’t “fair,” and I’ve thought…well of course they’re not! Did you think perfect fairness would be achieved in (mostly) five minute increments for (mostly) five year age increments? But I also didn’t have a sense of whether they were actually “easier” for men or women in any clear pattern, and this at least shows directionally how we might think about that question. I’m curious about the magnitude of these age/gender group gaps in terms of actual time. If you wanted to nudge those two lines to fit together perfectly, how much time would you subtract from the young women / subtract from the older women (or vice versa with adding to men’s times)? Short answer: it depends. On the young side, we start by making the young women’s BQ times about 15 minutes faster. On the other, we really need more 70/80+ marathoners (especially women) for it to matter. Don’t forget, ‘fair’ is not an objectively defined term.